ToyArk sponsor HobbyLink Japan is having a “shipping sale“. Pay with Paypal and get 70% off on shipping! Limited time only! From 10am June 22 to 6pm June 24, 2010 (Japan Standard Time; GMT+9)! Choose your preferred shipping method and get 70% off on shipping worldwide (excluding Japan) when you use PayPal! 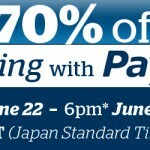 In order to showcase the safety and convenience of using their service, HobbyLink Japan is offering 70% off on shipping for all in-stock and shippable orders placed and paid for with regular PayPal or the highly recommended PayPal Billing Agreement between 10am June 22 and 6pm June 24 (Japan Standard Time; GMT+9). We believe that PayPal offers the fastest, safest and most convenient way to pay for purchases you make on the Internet. What’s more, if you set up a Billing Agreement with PayPal, you’ll only need to visit their site once in order to pay for current and future orders with us through your credit card or bank account. After that, a PayPal Billing Agreement lets you pay for all your HLJ orders without ever having to visit the PayPal website yourself. It’s fast, it’s easy, it’s convenient…and it’s safe! – Place an order or orders for any in-stock and shippable items between 10am June 22 and 6pm June 24 (Japan Standard Time; GMT+9). – During checkout, choose PayPal or set up a PayPal Billing Agreement. Even if you don’t have a PayPal account yet, you can set that up during checkout, too! – During that process, agree to pay for your order using regular Paypal or a PayPal Billing Agreement. Choose your preferred shipping method, too! – Enjoy a 70% discount off your shipping fees!